I enjoy making homemade bread from time to time. It’s not something I do every week but I probably make it about once a month. I’ve been tweaking this sourdough bread recipe for many years. Sourdough bread is fairly simple once you get the hang of it. A little note, you will need a sourdough bread starter, which I also have a recipe for and will post later this week. The starter recipe is not complicated but makes more sense if you already have a bread recipe to refer back to. I like sourdough bread because it’s much easier to digest than other forms of homemade bread. 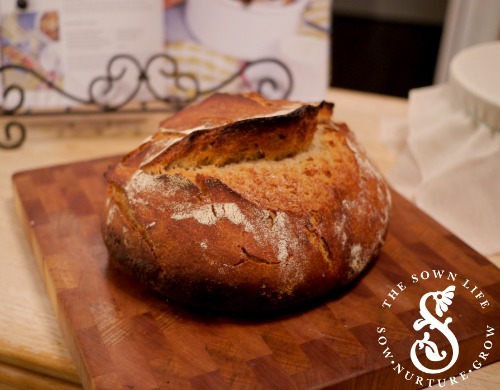 Sourdough has higher quantities of lactobacillus than other bread, which, you may remember, is the same type of probiotic found in yogurt. This is in the raw dough and doesn’t actually make it through the baking process, however, it does leave behind lactic acid. Lactic acid helps balance out phytic acid, which is found in lots of bread and inhibits the absorption of other nutrients. The lactic acid helps to make sure that the phytic acid is in balance and your body can digest the bread more effectively. Another note on lactic acid, it makes this bread naturally lower on the glycemic index. Overall, if you feel bloated after eating bread, then you may feel much better with a little homemade sourdough. I also like to add flax seed to this recipe. You all know how I feel about flax! Its such a good source of fiber and omega-3s. This is one of those recipes that feels like a treat to me. It is so fresh and delicious right out of the oven, I like to save my grain intake for having some of this whenever I make it. 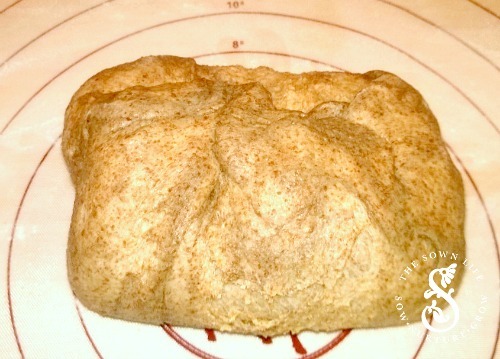 Homemade bread is also a cost-effective recipe to make for your neighbor or to take to a friends house. 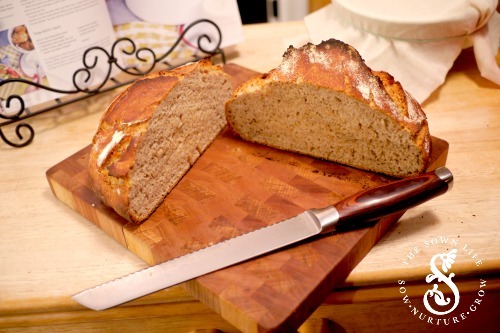 The ingredients are not expensive and people just love homemade bread! 1. Mix all ingredients until they are well-combined. 2. 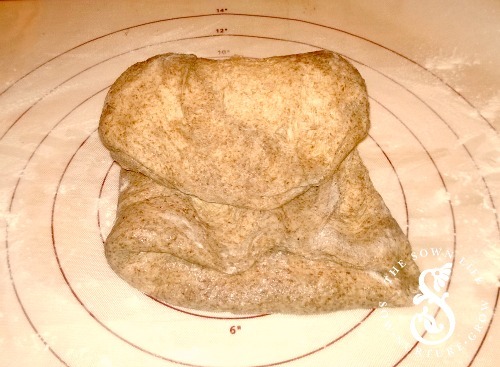 Place the dough in a large bowl and cover with a tea towel and large cookie sheet on top. 3. Let your dough sit out at room temperature for 12-24 hours. It may take a bit longer depending on the climate. This is usually at least an overnight process if not 24 hours. You are looking for your dough to rise and be larger in size but also to form tiny bubbles on the top. That is how you know its risen enough. 4. When your dough is ready, dump it out onto a floured surface and start kneading it by gently pulling it apart and folding it over on itself halfway. Alternate directions. 5. Flip the dough over so the seams are at the bottom and shape into a loaf. Set the dough on top of the floured tea towel on the plate. Then dust the top of the loaf with flour and lightly fold the corners of the towel over on top of the loaf. Let rise for another 45 minutes. 6. 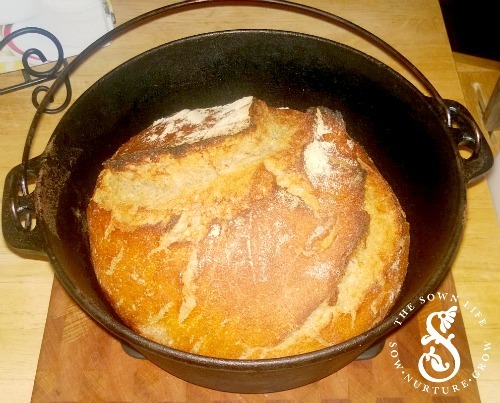 Place a dutch oven, with the lid on, inside your oven and preheat to 500 degrees. When the oven is ready, place the ball of dough, seam side up, directly into the hot dutch oven and bake covered for 25 minutes. 7. After 25 minutes bake uncovered for 15, or until the top is brown and crispy. Wait about 15 minutes to eat your bread. Enjoy with farm fresh butter, homemade preserves or make avocado toast the next morning for breakfast! Yummmm. Mix all ingredients until they are well-combined. Place the dough in a large bowl and cover with a tea towel and large cookie sheet on top. Let your dough sit out at room temperature for 12-24 hours. It may take a bit longer depending on the climate. This is usually at least an overnight process if not 24 hours. You are looking for your dough to rise and be larger in size but also to form tiny bubbles on the top. That is how you know its risen enough. When your dough is ready, dump it out onto a floured surface and start kneading it by gently pulling it apart and folding it over on itself halfway. Alternate directions. Flip the dough over so the seams are at the bottom and shape into a loaf. 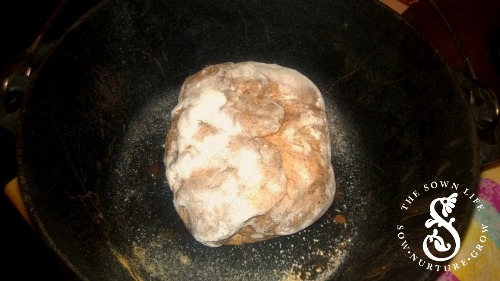 Set the dough on top of the floured tea towel on the plate. Then dust the top of the loaf with flour and lightly fold the corners of the towel over on top of the loaf. Let rise for another 45 minutes. Place a dutch oven, with the lid on, inside your oven and preheat to 500 degrees. When the oven is ready, place the ball of dough, seam side up, directly into the hot dutch oven and bake covered for 25 minutes. After 25 minutes bake uncovered for 15, or until the top is brown and crispy. Wait about 15 minutes to eat your bread.